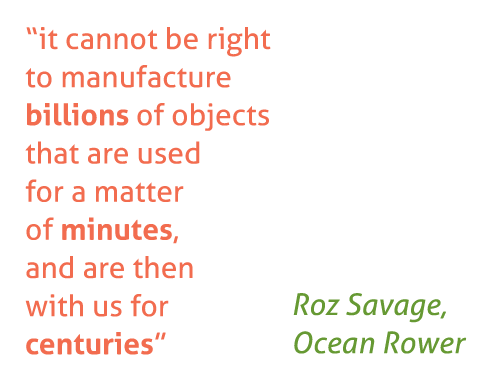 Roz Savage, having rowed the world’s oceans and set several records, has seen the impact of plastic bags at first hand. She promotes plastic-free communities as our co-patron and as a Notable Coalition Member of the Plastic Pollution Coalition. She also supports the work of the 5 Gyres Institute, is an Ambassador for Plastic Oceans and a Myoo Myooze. Roz Savage had an environmental epiphany after reading about the Native American belief that we have to take good care of the land if we want it to take good care of us. She turned her back on a materialistic lifestyle and embraced a simpler life uncluttered by possessions. 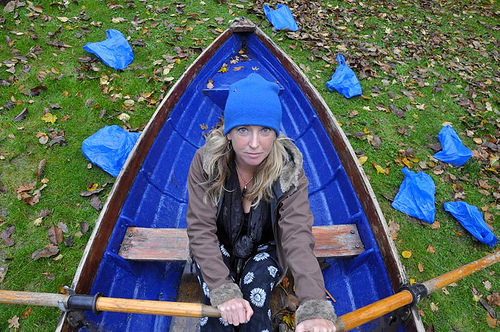 Her key message is that, like her ocean rowing voyages, we can accomplish great things by taking a huge number of tiny steps in the right direction. Our present environmental challenges have largely been created by billions of humans making daily decisions that don’t best serve the long-term interests of either the Earth or humanity. By taking personal responsibility and making wiser decisions, we can re-set our course for a cleaner, greener, brighter future that combines the best of civilization’s achievements with principles of sustainability. “The UK is shamefully wasteful. In fact we generate enough waste every two hours to fill the Albert Hall. At a time where pressure on the world’s resources has never been greater, we have to find a way to be more efficient. The first priority is reducing the amount of waste we generate in the first place, and the only way to do that is to make waste a liability. Companies will then operate in such a way that minimizes that liability. Of all the waste we generate, the plastic bag is perhaps the greatest symbol of our throwaway society. They are used and then forgotten, and they leave a terrible legacy. The figures are shocking. Each year 13 billion bags are used and thrown away in the UK. Each bag will be used for an average of 20 minutes, and once discarded will take anything up to 1,000 years to decompose. About 98% will end up in our already overflowing landfill sites. Some 200 million will litter the countryside. Thousands of Sea turtles, whales, and countless other species mistake the bags for food and once ingested, the bags block the animal’s insides and cause a horrible death. Countless countries have taken the initiative to ban or phase out the bag. China, South Africa, Bangladesh, India, Kenya, Taiwan and San Francisco have all introduced bans. Others have introduced a bag tax. In Ireland for instance, a bag-tax has led to a reported 90% reduction in the number of bags used. In spite of a sluggish response by our own leaders, things are beginning to happen in the UK, not least in Kew, where all of the local shops with the exception of Tesco have agreed to take get rid of the plastic bag. 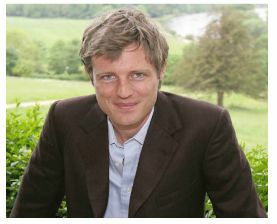 Zac Goldsmith is MP for Richmond Park and North Kingston, and Director of the Ecologist Magazine.